Rich in historical past that witnessed various dynasties ruling the area including the Chalukya dynasty, Mughal Empire, Portuguese power and the British, the port city of Surat has always shown its mettle in the textile and diamond business. Needless to say thanks to its commercial importance, Surat was also a prized possession for the abovementioned powers. One of the cleanest cites in India, Surat is the second most populous city in the state of Gujarat. Located on the banks of Tapti River, arc-shaped city also brims with numerous cultural delights to savour. The ideal time to visit Surat is October-March. Located near the Tapti Bridge, Surat Castle was built in 1546 by Sultan Mahmud III of the Gujarat Sultanate and Khwaja Safar Salmani (an Albanian Christian who later embraced Christianity) to thwart attacks from Portuguese invaders. The 16th century fort saw the addition of Turkish guns a few years after it was constructed, but despite a robust exterior, was attacked by the Maratha ruler Shivaji’s troops and finally captured by the English 1759. Housing offices today, the Surat Castle, the most important historical highlights in the city, is worth a visit to soak in the remnants of a tempestuous past and provides a beautiful view of Surat and the Tapti River. 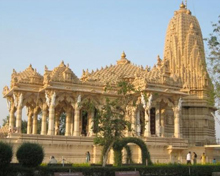 Built in the 17th century Chintamani Jain Temple is an architectural marvel in itself. Its striking wooden walls, which are painted in vegetable dyes, complement the amazing paintings and carvings of famous Jain teacher Acharya Hemachandra and his devoted disciple Kumarpal, the Solanki ruler of Gujarat. The temple is open throughout the day. Located near the Kataragam Gate, the cemetery stands testimony to the lives of Dutch and British officers in the pre-independent India. 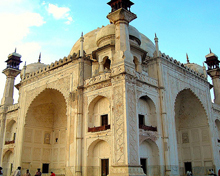 Gorgeous arches, beautiful pillars, exquisite mausoleums and decorative cenotaphs are etched with sentimental verses. The imposing tomb of Baron Adrian Van Reede is known for its huge dome. Adjacent to the cemetery is the churchyard of yet another trading community from the 16th century –the Armenians. Both these places can be a little difficult to locate, so it is advisable to the help of the locals. 16 Km south-east of Surat, Dumas Beach is favourite with scores of families who come here for a picnic and enjoy the clear blue waters of the sea against the backdrop of brethataking sceneary. The beach is lined with shacks whioch serve an assortment of piping hot bhajias- potato, chilli, tomato and banana-accompanied by delicious sweet chutney. If you are lokking for solitude, you can head towards the casuarina-fringed Suvali beach which is 22km from Surat. Suvali is the place where the famous battle of Swally was fought between the Portuguese and British in 1612, after which SUrat remained the seat of the British power until 1686. 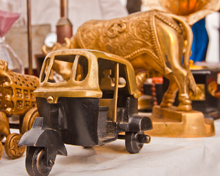 The cacophony of vendors fills the open space between Makkai Bridge and the New Hope Bridge every Saturday, Scout for charming trinkets and other hidden gems as early as 6 am at one of the largest flea market in Gujarat. Although navigating through a sea of people, handcarts and stray animals in the crowded lanes can prove to be quite a challenge, the experience is worth your while. Rummage through colonial style lamps, art deco clocks, vintage teacups, bangles and furniture- and be prepared to haggle. Jet Airways has daily flights to Vadodara from Mumbai, Bangalore and Hyderabad. From Vadodara, Surat is 150 km away by road. It is said that heaven is attained when one dies at Kashi or has a meal in Surat. Connoisseurs often make a beeline for Locho, a dish made from Khaman batter. 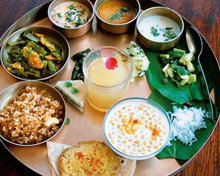 For the quintessential Gujarati thali, visit Susama, a restaurant near Athwa Gate.